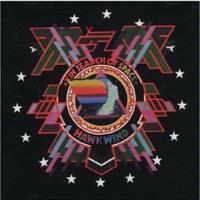 In Search of Space (sometimes referred to as X – In Search of Space) was Hawkwind’s second album released in 1971. It found the band working through a lot of the same tribal chant oriented sounds as the self-titled predecessor, but also gave rise to the incorporation of some of the more progressive rock oriented textures that would become more common in their sound. As with any Hawkwind album it’s kind of hard to do a good job of describing the music in detail. So much of the group’s sound is derived from the workings of all the layers as one – in sort of wall of sound approach. It’s really difficult to pull those particular pieces from one another and examine them. Besides that a lot of the movement within Hawkwind’s music is based on subtleties. More often than not nothing changes quickly, instead minor alterations will appear gradually and by the time they’ve take over you don’t know how it happened. Such subtlety is really one of the crowning achievements of the band. There is always so much going on in the periphery that if the overall song structure doesn’t change a lot you never really notice. This is truly one of the great classic Hawkwind albums and one of my favorites. Echoey sound effect like textures start this one slowly and tentatively. Eventually spacey textures and the sound of a pick being drawn up the strings of a bass guitar enter to move the cut forward. From here a climbing synthesizers takes it pulling it up. The main pounding structure of the track begins to emerge amidst this. Finally the band launch out into a smoking tribal-textured jam that is trademark space rock. Saxophone wails mournfully over the top of this bouncing rhythmic pattern. The group work through several incarnations of the themes, with different instruments taking the lead at varying points in a total prog rock, space jam. A chanting starts over the top of this as the cut moves onward. More types of chanting come in and the pattern of alternating lines that merge with the lead vocal pattern (all of these and similar volume levels) produce a kind of ebb and flow that in some ways mirrors the motions of the track itself. Eventually this goes away and the keys and sax weave lines of melody across the backdrop of the rest of the group. This becomes both beautiful and powerful, yet slightly dissonant and unsettling in a way. The distorted bass adds another layer to this soundscape. They move this out into chaos at about seven and a half minutes into the piece. Then it starts to coalesce again in a hard edged and powerful movement that carries the same central themes as the rest of the track. Still, much of the drama here is derived from varying instruments weaving similar melody lines over the whole affair. A break emerges for a short period of a fast paced, almost staccato pattern, then they launch back into the central themes with frantic soloing overlaid. Space chirps and such are heard over varying points. At around nine and a half minutes the vocals return. The band take it from there in one more powerful space journey. The bass drives it throughout, but takes more precedence at points during this extended segment. They drop it back for a time, then move out into more spacey territory with echoey feedback type sounds carrying it. Eventually just the tribal percussion remains, then they power back up into the central themes. A furious reprise ensues with more ethereal instrumental soaring placed over the top. A new vocal section with a distorted, swirling sort of delivery takes it. They wind the instruments down during this and then just the drums remain in a seeming nod to Iron Butterfly’s “In A Gadda Da Vida.” Whirring keys come over the top of this drum solo at points. This combination serves to end the track. Once it’s done you’ll be hard pressed to believe that it lasted almost 16-minutes. That’s how enjoyable the ride is. This one comes in rather tentatively, but once again the bass comes in to drive the track. More sung vocals come in with “oohs” over this backdrop and then Dave Brock’s vocals come in with the other singing – along with weird chirping and whining keys – still carrying on. The more space-oriented sounds remain after Brock’s vocals end. This moves out into an interesting jam with repeated echoing lines of guitar joining into the fray. Then Brock turns out a full on (albeit fairly brief) guitar solo. As the cut moves forward, though, he can still be heard weaving lines of sound with his fretboard. Flute comes over the top of this after a time. The volume level drops way back and after a time the bass is once again the predominate instrument. They wind through like this for a time, different sounds emerge over the top of the sonic tapestry at various points, then power it back out into a bit more furious take on the themes. The saxophone solos stubbornly over the top later and the group keep working through in a sort of hypnotized abandon, gaining and losing volume at varying points throughout. The whole unit is so organic that it’s really hard to pull one part away from the rest. The whole thing functions as a living whole. Eventually this drops to space sounds and then textures of waves hitting the beach remain. Some noisy (but understated) echoey guitar threatens to take over, but never does, instead fading away with the waves to end the track. This is one of early Hawkwind’s heaviest numbers and was also a trademark piece in many ways. Maybe the guys who did the He-Man cartoon were influenced by it? Probably not, but you never know. What a different show that would have been if they’d used this as the theme song. A whining sound, much like a weapon powering up to fire starts this off and keeps climbing towards overload. Eventually a guitar segment comes in and the whole band slowly rise to meet it. The vocal line is mostly spoken over this backdrop with a great echoey texture to it. Space rock squeals and squacks rise and fall during the course. They turn a corner after the verse, seeming to be ready to launch into a new movement. Instead, though, they seemingly end the piece, but it is reborn in the earlier modes from this false ending. This time they launch into an instrumental space rock journey on the themes. This gets quite powerful and waves of sound continue to sweep over the top of the mix. The same hint of a new journey about to unfold gives way to another false ending and the bass restarts the jam. Clipped echoey guitar, common throughout the disc, joins the fray and then the track is rejoined by the rest. The final verse of vocals come in here and take it to the closing changeover segment. After what we’ve heard to this point, when the thunder-type sounds in the background take it, you really expect the melody to rise up one more time. This has always been a personal favorite of mine. It has a ballad format, almost folk rock in nature. The sound of seagulls can be heard in the background and nearly the foreground. The vocal line is delivered in an almost monotonous form, but it works quite well. Space keys wander over the top during the track. This is a warning about the destruction of the environment and other type things. The sad part is, while Hawkwind saw the threat in the early 1970’s the world in general has stayed on the same path and the effects are starting to become irreversible (or at least very hard to reverse now). Too bad more people in power weren’t listening to Hawkwind. This powers out into a folk rock prog version of its themes as it moves through the midsection. Then it drops back to the stripped down acoustic guitar almost unaccompanied format for the next verse and chorus combination. A picked segment takes it out with space keys laid over the top in a rather extended outro. This is a strange song. Let’s get that out of the way right off the bat. The truth of the matter is, it’s also quite original and very interesting. Musically, weird whining, twirling sci-fi keys and other instruments in sort of Pink Floyd like psychedelic tapestry lead it off. Then a droning guitar sound takes it. The odder elements still remain around the top. As the cut moves upward a slowed down voice begins the poetry recitation. As time moves forward the speed of the voice increases and just a little past the normal range the line “androids are we” is delivered. Then we hear repeated requests to “adjust me” as the voice speeds to a high-pitched chirp. After a time this voice goes away, then the group explore new space textures until settling on another trademark rhythmic structure, over which more waves of sound are laid. This is the mode of the rest of the cut in an expansive sort of progression that grows organically. At the very end, though, the whole song spirals out of control by the same type of increased speed the voice experienced. At just over 3 minutes this is the shortest number on the disc. It’s also one I like quite a bit. It’s another space rock oriented acoustic based ballad, and a very potent one at that. They eventually turn this into a powerful hard-edged band sort of take on the musical themes. As flute weaves lines of melody over the top it feels at once very hippie like, but also rather Native American in tone. This eventually fades out to end. It’s a great conclusion to a killer album, but I would have liked this particular friend to stay around for a while longer. Leave them wanting more is always a good approach, though.